That bastion of the male world, the Barber Shop, with its candy-striped pole, leather strop and copies of the Police Gazette lying around for your perusal as you wait for your favorite barber to call you next, may have for the most part disappeared; but the art of conversation between a man and his barber (for want of a gender-neutral term) has not. For the past 30 or more years I have had my hair cut by Luigi, who with his brother Enzo, runs “The Isaia Hairstyling Salon” in the Riverdale section of The Bronx. Luigi (Louie) and Enzo emigrated with their parents from a town near Salerno in the Campania region of Italy when they were children. They started life in America in the Belmont section of the Bronx, also known as Arthur Avenue. When Louie was a stylist working at Vidal Sassoon in Manhattan, he was known as Bernard. That name stayed with him for a time after he left, but eventually he became Louie once again, as the brothers’ own business began to flourish, back in Da Bronx. When my hair used to grow more quickly, I’d schedule a visit to Louie about once every 4 or 5 weeks. These days visits are usually 8 to 10 weeks apart, and it’s not because I’m letting my hair grow longer, there’s just less of it to cut. So I figure that Louie and I have had at least 250 conversations over the years. We’ve discussed politics, sports, the economy, crime, religion, family and the changes in the neighborhood. But every visit has included a conversation on our two favorite topics, movies (principally Italian Cinema) and food. Louie enjoys cooking and sometimes, when he knows I am coming in for a haircut, he surprises me, as he recently did, with something he whipped-up the previous night. On our most recent visit to our hometown New York, which included a haircut from Louie, the surprise was Mussels Marinara, not with linguine, nor tagliatelle nor penne or some of the more fashionable cuts of macaroni, but with good, old-fashioned, comforting, spaghetti. It was delicious and Grammy and I devoured it that night when we returned to Falmouth. The other day, I made a visit to The Clam Man, our local fishmonger, and as luck would have it, they had a batch of big, black, shiny mussels. 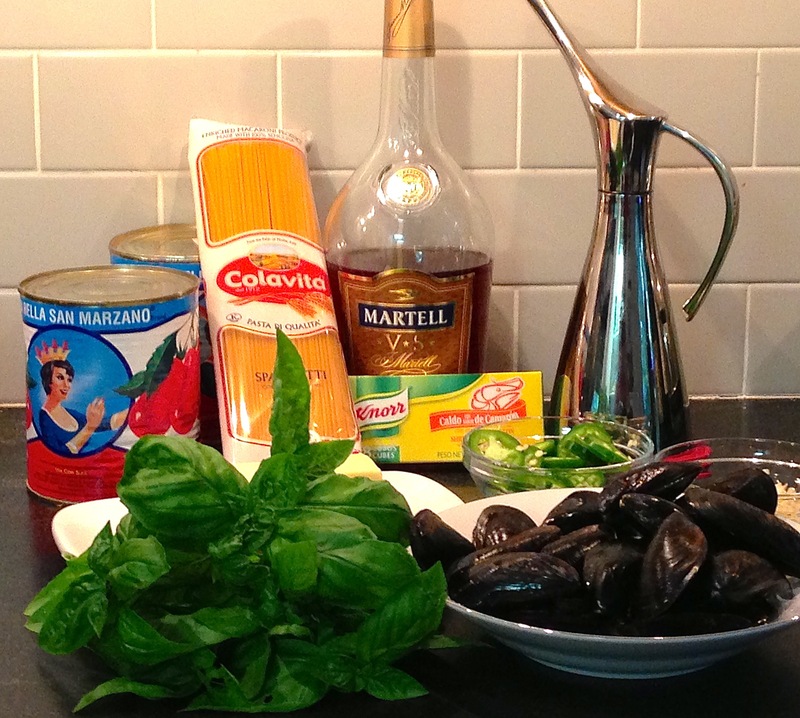 With an eye to preparing Louie’s mussels and spaghetti, I bought 2 dozen of the bivalves. Remembering what Louie had told me about his three special additives: brandy (I used Martell Cognac, which I use for my Steak au Poivre), jalapeño pepper and Knorr’s Caldo con Sabor de Camarón and guessed at the proportions. I don’t think it was exactly the same as Louie’s version, but it was delicious. 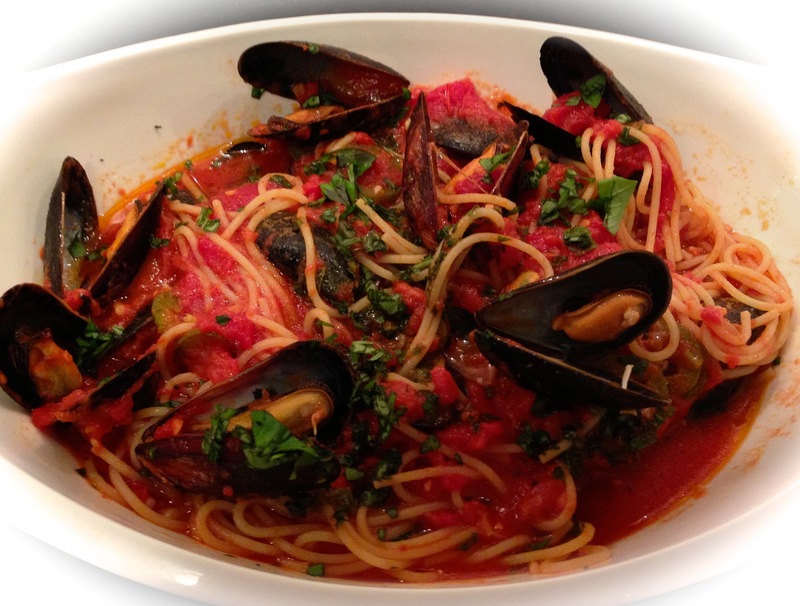 So here it is folks, the real deal, Mussels Marinara with Spaghetti alla Luigi. 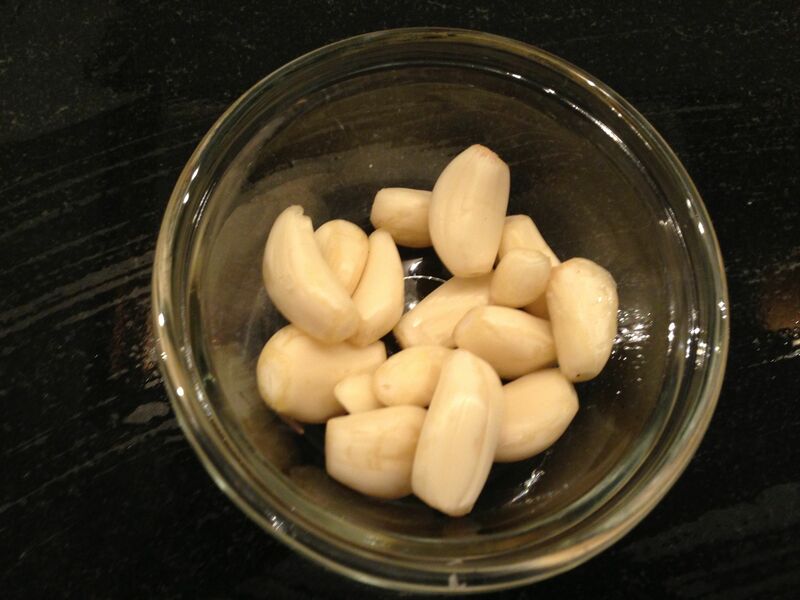 If you’ve been following our postings, you no doubt know that to us, garlic is essential to life itself. And if, like us you love garlic, but hate to peel those little cloves and don’t want to spring for the costly pre-peeled garlic that usually goes bad before you can use it all, then we have the answer to your dilemma. Just ask Martha! That’s right folks, Martha Stewart has a video on how to peel all the garlic you will ever need. 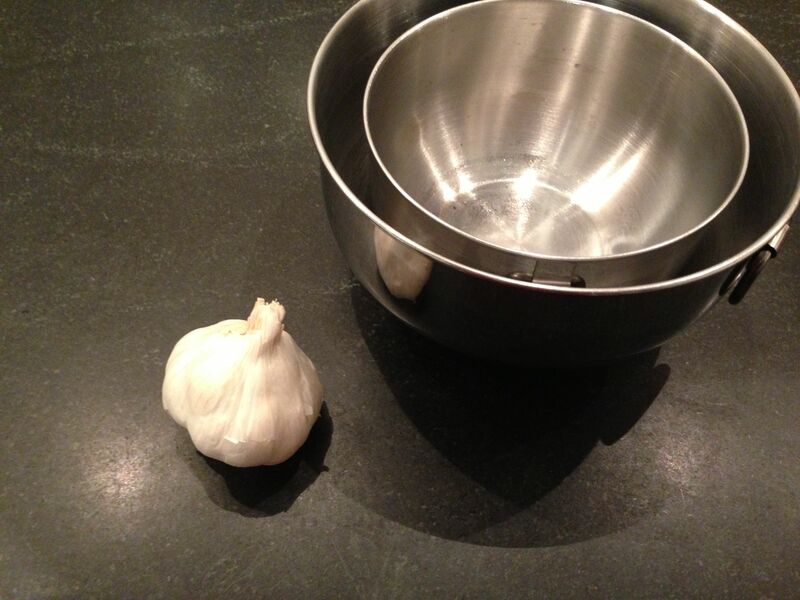 Now you can have garlic with breakfast, lunch or dinner, no mess, no fuss. Garlic and orange juice, why not? Garlic in oatmeal? Sure! Ham and cheese on garlic bread? No problem, mon! We don’t have two bowls that are same-sized, so we tried this trick using the two smaller bowls of a metal three-bowl set. For whatever reason, it didn’t quite work; while several cloves did separate from the head and some were actually peeled, we didn’t experience the same results as Martha. Maybe it was because the bowls were not the same size, or the garlic was too old, or too young, or we didn’t shake it long enough. So we tried a different technique. We first separated each clove from the head, then cut off each clove end. That minor modification worked just fine! Try it and let us know your results. Summertime and the Livin’ is Easy – Fish on the grill, served with a fresh homemade salsa of pineapple, mango, cilantro, red onion and lime juice, with a little heat provided by chopped jalapeños and Anche chili powder. Serve that with grilled vegetables and sautéed mushrooms, prepared in advance, and you can entertain easily AND, if you can’t stand the heat, get out of the kitchen. I went to the localfish market yesterday, intending to grill a fillet ofstriped bass and serve it oreganata style for last night’s dinner. But the fishmonger told me that the season is over; however, he did have a supply of freshly-caught, ‘harpooned swordfish‘. Change of plans necessary! A humorous posting with great photos. I commented on it as follows: Clever as ever! The story of the sheep reminded me of a postcard that I once sent from Ireland to an Englishman friend. On the front was a picture of a sheep at pasture, with the title “Missing Ewe”. I scribbled some nonsense on the back about hoping he’d return to me soon, and signed it, “Love, Deirdre.” His wife was not amused! I was not familiar with the term “pangritata” and you inspired me to Google it. I discovered that I had eaten it before, in a now defunct Sicilian Restaurant in New York. It was spread on a dish of Spaghetti con Sarde, which my father had always raved about, and which his mother used to make. You have motivated me to attempt to re-create it. Thanks! The sheep in the adjoining field are very keen on bread, in all its varied forms. They are keen on it because we, not being farmers but eaters of farmers’ produce, have fed them the bread, for which we have no further use, and the sheep couldn’t be happier. They could be happier, but couldn’t we all. Giving them stale bread is as far as I can go in bringing happiness to sheep, particularly as the sheep in question are barely acquaintances of mine. A line has to be drawn somewhere and drawing it between me and sheep pleasuring is in the true spirit of the Alamo. Sacrifices have to be made. Growing up, mixed vegetables frequently meant boiled peas and carrots, compliments of Birds-Eye®. Open the box of frozen “mixed vegetables”, place the contents in water, boil them to remove all flavor and nutrients, then smother them in butter and salt to make them somewhat palatable. I must admit however, that Birds-Eye® have come a long way since the 1950’s! With summer in full swing and Farmers Markets popping up everywhere, “mixed vegetables” takes on a new meaning. Pick up some eggplants, preferably the small Italian variety, some red peppers and a couple of zucchinis. And, if you are so inclined, add a red onion and a summer squash, but its your call. 3 Italian Eggplants, cut into 1&1/2 inch cubes (leave the skin on for added flavor and crunch). 3 Red Peppers, cored, seeds removed and cut into 1-inch squares. 2 Zucchinis, sliced into thin circles (1/4 inch or less). 1. Heat a gas or charcoal grill to very hot, a covered grill is best in order to concentrate the heat. 2. Place the cut-up vegetables in a very large bowl. 3. Pour in the olive oil and toss well. 4. Add salt, pepper and basil and toss well again. 5. 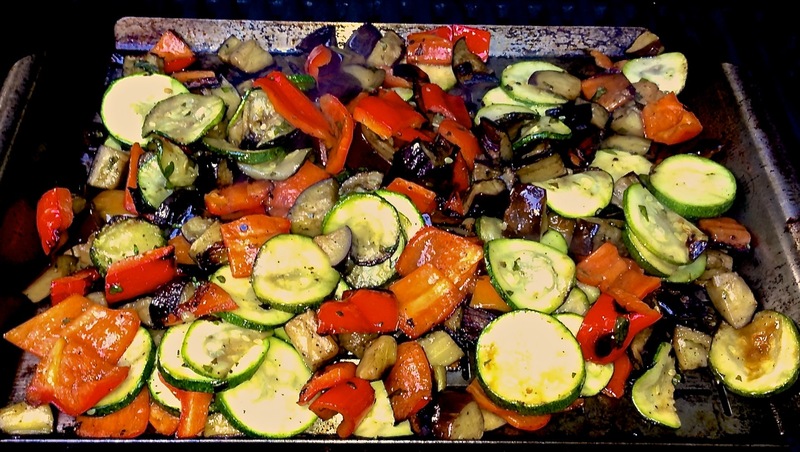 Place vegetables on a grill pan and roast with the grill cover closed for 25 to 30 minutes until cooked to your liking. Serve as a side dish or main course. As an added plus, place the leftovers in a gallon-sized Ziploc® bag and refrigerate for two or three days. Get some Italian bread with a good crust and a fresh mozzarella; slice the bread in half lengthwise, add the cold vegetables to the bottom half, cover with several slices of mozzarella add the top half and you are in veggie heaven. 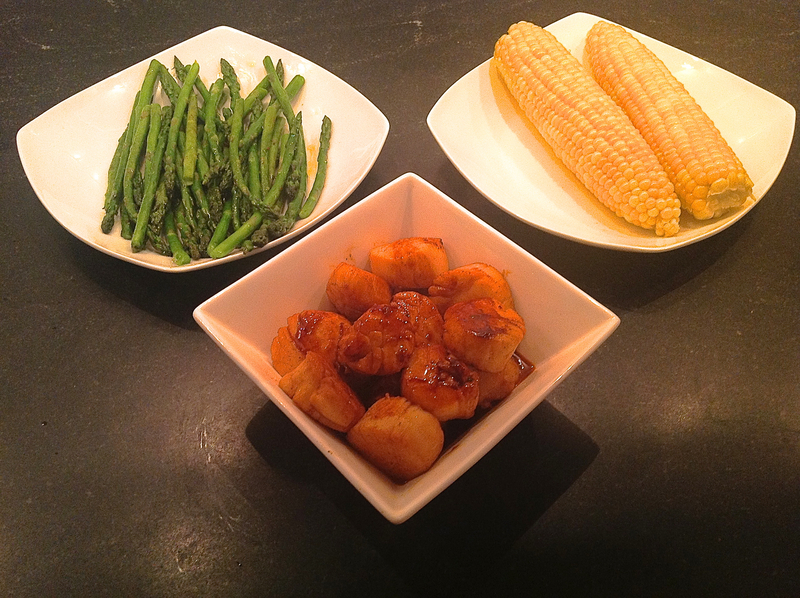 A quick summer meal in vibrant colors of green, white and yellow and red – Sautéed Scallops, Sautéed Asparagus and Corn on the Cob. What could be wrong with that combination? Absolutely nothing. 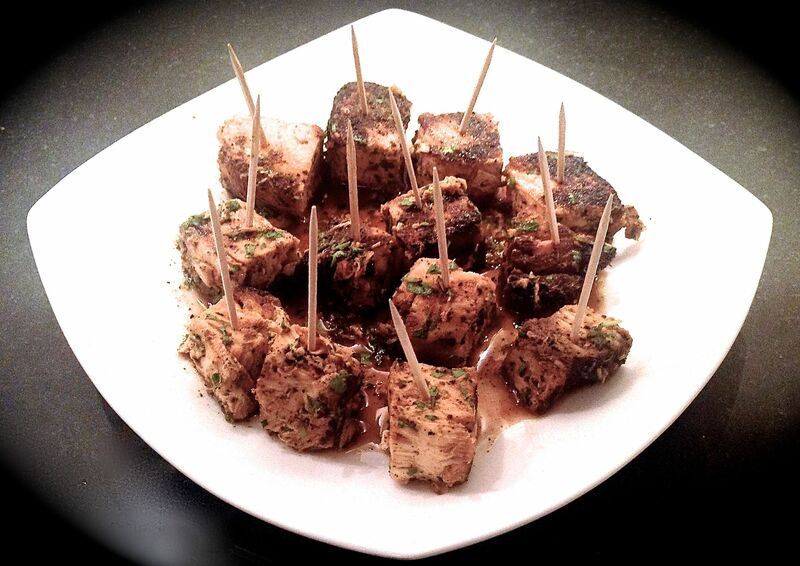 It is delicious, nutritious, easy to prepare, cooks quickly and looks beautiful. That was dinner for two, one blisteringly hot and humid night last week. But with double the ingredients, it could easily become an elegant meal for guests, as long as they don’t have a shellfish allergy. A visit that day to our local fishmonger revealed beautiful sea scallops, not the little bay scallops, which shouldn’t be sautéed because they don’t stand up very well to high heat. These scallops were fresh, sweet and had no off-putting odor. Sprinkled with paprika and quickly sautéed in butter and served with a light sauce of pan juices, deglazed with white wine, they were heavenly. The asparagus were first steamed, then quickly sautéed in garlic and oil. All while the corn cobs rested quietly in a pot of previously boiled and lightly salted water. Dinner was ready in about 20 minutes. 1. Bring a large pot of water to boil. When it begins to boil, stir in the salt, add the corn, shut the heat and let the corn sit in the boiled water until ready to serve. This technique cooks the corn, but does not overcook it. 2. Dry the scallops with paper toweling and sprinkle with 1 Tbsp. of the paprika. 3. Quickly steam the asparagus, when they turn bright green remove from the pot and set aside. 4. Heat a non-stick pan on high, gently add the olive oil, when shimmering add the garlic and stir. Add the asparagus and sauté for 2 or 3 minutes retaining their bright green color. Keep warm. 5. Heat a non-stick skillet large enough to hold the scallops without overcrowding. When hot, add the butter. Just before the butter begins to brown, add the scallops, paprika-coated side down and sprinkle the tops with the remaining paprika. 6. Sauté the scallops for about two minutes, until lightly browned, turn and repeat. When cooked to your liking, (I prefer them slightly undercooked) add the wine, bring to a boil and let scallops cook for 30 seconds more. Remove the scallops and set aside. Reduce the pan juices until by half, stir in the cream, let heat for 15 seconds. 7. Pour the sauce over the scallops and serve all immediately. Serve with a chilled crisp Albariño or a Rosé and beat the heat. Last month, while visiting my favorite butcher, Vincent’s Meat Market on Arthur Avenue, the “Little Italy” (a/k/a Belmont) of the Bronx, I spotted a prosciutto end, which is hard to come by in Falmouth. Thinking I would use it in a batch of Pasta e Fagioli, I added it to my meat order. But, last week with the sudden onslaught of summer heat and humidity, preparing a winter dish like that over a hot stove held little appeal and the thought of eating one held even less appeal. Since the prosciutto was cured and vacuum packed, it probably would have lasted three or four more months in the refrigerator, at least until the onset of cold weather. However, each time I opened the refrigerator door it called out to me; after all that is its nature, to be eaten. One of life’s greatest combinations is prosciutto, mozzarella, roasted red peppers and basil. Put those four ingredients on a chunk of crispy Italian bread, drizzle on some olive oil and you’ve got yourself perfection. But I don’t have a meat slicer, and for inclusion in a Hero (Grinder, Sub, Hoagie or whatever its called where you come from; I’m from New York so it’s always a Hero) prosciutto sliced in any way other than paper-thin would be a sin. Besides, crispy Italian bread is a rarity in Falmouth, where most bakeries are in giant supermarkets. That tri-color combination, red, white and green, which happens to reflect the colors of the Italian flag, is perfection itself. So what else to do with the remains of this generous little pig? When all else fails, man’s thoughts turn to…PASTA! Now for the alchemy. First, I thought I would lightly brown the prosciutto in its own rendered fat. 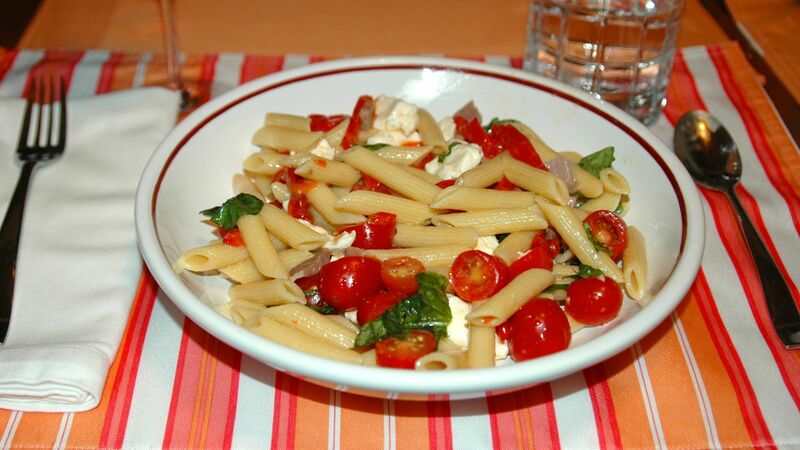 Then, toss the mozzarella with the hot pasta letting it melt. Finally, add the prosciutto and other ingredients, and and serve it at room temperature. The execution worked well, but for two hitches, and the meal turned out to be appetizing, but perfection was not attained. I have added some footnotes to the recipe for Summer Penne, which I intend to incorporate next time. But that will have to wait until the next butcher run. 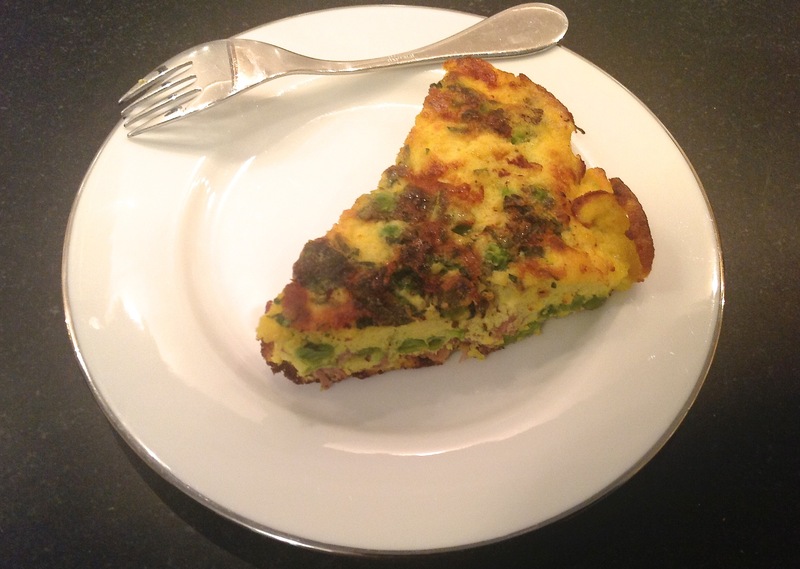 A few days later, using the remaining bit of prosciutto, I prepared a Frittata with Peas and Herbs, which served as the keystone for a delicious Sunday Brunch. Our supply of this hot sauce for is gone, so tomorrow we will cook up a new batch. Double this time. I am looking forward to my next bowl of “macaroni” enhanced with Mom’s sauce. It will be like going home again.